Today I gave a short presentation to my guild at our monthly meeting about shuttles and I thought I'd share it with you. One common definition of a ‘weaving shuttle’ is that it is an appliance which holds the weft, and which can be passed or thrown through the shed in the warp. These are a few from my collection. The simplest shuttle is a flat stick that has a notch at each end. It can be passed through the shed but cannot be thrown. Loading the stick shuttle begins with a slip knot looped over a notch the yarn is built up in figure eights alternating sides after every few passes. This builds the weft up outwardly to minimize the drag of the shuttle going through the shed. The weft must be unwound by hand every pick and care must be taken to unwind enough yarn to pass through the shed without tugging on the selvedges. The middle two stick shuttles have a tapered edge on one side. The edge can be used to beat the weft into the web. The rag shuttle has two flat sides and pointed ends. These sturdy shuttles have traditionally been used for rags although they are excellent for heavy rug yarns and chenille. They must be unwound by hand every pick. There are two distinct styles of rag shuttle, open bottomed and closed bottomed, but both styles have sides high enough for all the yarn to pass smoothly through the weaving web. These shuttles are wound in a circular path around the centre of the shuttle. Ski shuttles do essentially the same job as rag shuttles and are designed to hold medium weight yarns. Begin winding the shuttle by holding the yarn in place around the ski base and anchoring the yarn with subsequent passes. Continue until the ski section is full but not overflowing the shuttle. This allows the smooth bottom and top of the shuttle to slide through the web. These shuttles are unwound by hand before each pick. Boat shuttles were the first type of shuttle that unwound in a continuous and automatic manner. The boat shuttle has a spool or bobbin rotating freely on a fixed spindle. The shape, size and weight of the shuttle vary and should be chosen with the weavers needs in mind. Currently two styles are most prevalent, open bottom and closed bottom, there is little difference in the performance and is strictly preference. There is little doubt that a boat shuttle loaded with a bobbin increases your efficiency because you don’t need to unload the yarn at every pick. Boat shuttles are excellent for looms with shuttle races like table looms and floor looms. The quality of the weaving bears heavily on how well the bobbin is loaded. To wind a bobbin you fill up each end of the bobbin in turn, close to the inside of the bobbins ends. Then you run the yarn back and forth across the centre of the bobbin evenly, right up onto the ends which have already been filled. Lastly you create a small hump in the centre of the bobbin. Filling the bobbins evenly like this stops the yarn from tugging and giving you ‘mouse nibbles’ at the selvedges. A helpful hint is to extend the slit on the side of the shuttle, it should be the length of the bobbin. This decreases the angle that the weft is released of the bobbin, which helps to even the tension that the weft is released from the shuttle. 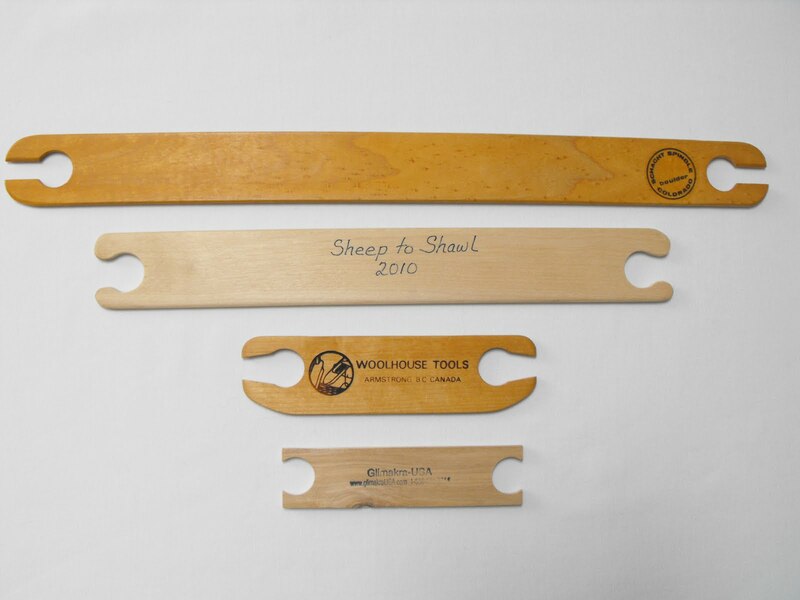 A double boat shuttle is a very specialized tool that you may choose when you want to put two wefts through the same shed. Although you can wind two threads together onto a single bobbin, it’s really difficult to keep the yarns from crossing around each other and to maintain an even tension. Inevitably one gets wound tighter than the other regardless of how much care you have taken. Winding two separate bobbins and releasing them individually alleviates the problem. These shuttles are the ultimate automatic releasing shuttle for hand weaving. They are lightweight, comfortable to throw and catch, adjustable to a variety of yarns and easy to thread. The end-delivery shuttle has a pirn which remains stationary, instead of a free spinning bobbin. The weft yarn unwinds off the pirn’s tip when the shuttle is in motion and stops unwinding when the shuttle stops unlike a bobbin which continues to spin and release yarn. The yarn comes off the pirn and goes through a set of tension pads and comes out of the shuttle at a constant tension. This even delivery of weft causes less draw-in, which in turn makes better selvedges. Pirns are loaded differently from bobbins; they are wound from the large end toward the narrow end, decreasing in volume as you go along the pirn. You can never backtrack more than a half inch or so while filling a pirn or the yarn will not unwind correctly. Here is an old post on how to wind a pirn. My favourite End Feed Shuttle is a Schacht because it is so light, it's the lightest on the market. And because the tensioning system which is incredibly easy to thread, some of the others you need to use a crochet hook and good luck. But with a Schacht all you need to do is pull about a three inch length off of the pirn, hold the thread with your finger against the pirn to give it tension then just place the thread between the pads and follow the slit. Easy! These were formerly used to mend nets but now have become a tool in the hand weavers arsenal. They are not shuttle in the truest sense of the word, but rather a pointy end attachment to get the yarn through the web. The yarn is not wound on the needle but rather hangs freely like a hand sewing needle. 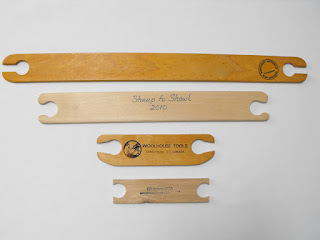 This is a great tool for tapestry and inlay techniques where the weft is carried in and out of the warp, rather than as a primary weft supplier. The pirn is for scale. As the name indicates these tiny shuttles are used for hand tatting, but are quite perfect for holding those tiny fine threads used for inlay or finger manipulated weaves. The shuttles are loaded by sticking the end of the thread through the hole in the centre of the shuttle and wrapping the thread round the bobbin until it is fully loaded. Only a tiny amount of yarn is held on this shuttle. Again the pirn is for scale. This is a really great tool for securing yarns while weaving. Designed for use with the Loucet or Kumihimo Disks they serve admirably for inlay, finger manipulated weaves or as I have used them in the past for weaving bookmarks, five patterns at the same time on the loom. They are loaded by pressing the centre and popping the spool open, then winding the yarn around the centre. Clicking the E-Z-Bob closes secures the yarn in place and they must be manually unwound for each pick. That's it, it is amazing all the different shuttles that are out there.